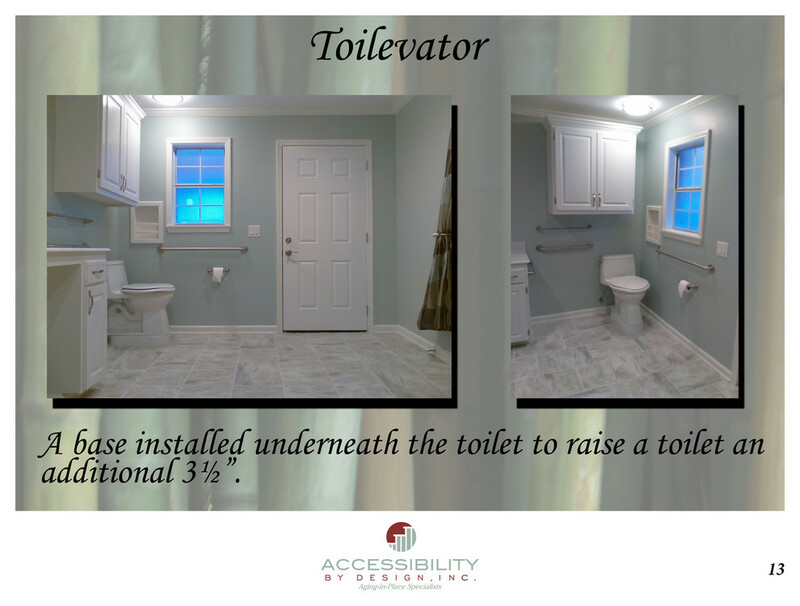 A base installed underneath the toilet to raise a toilet an additional 3 & 1/2"
Custom built additions to homes where spaces are needed for wheelchair access primarily to a bathroom and bedroom suite. Available in many sizes, colors, and styles from Best Bath. Lifetime warranty. Grab bars can be places anywhere in the shower due to the 1/2" plywood interior construction. With or without fold-down padded shower bench, has a hand-held shower on a grab bar and lever-style controls with thermostatic regulator. A high end option using natural marble or stone with a ceramic tile shower pan. An affordable option that can look like real stone. Durable reparable and barrier-free. Can be installed as a product (as opposed to new home construction) in homes with a concrete foundation. Available in many patterns and has all of the accessories that can be included with the fiberglass shower. A higher end product with a lifetime warranty. Can be customized with detailing in many colors on the door and can be ordered in colors other than white. Fiberglass with a hand-held shower and grab bars. An affordable option for a walk-in bathtub. White fiberglass. Available in a wheelchair-accessible model with an out-swing door. Has a hand-held shower and grab bars. Available as a soaker tub or with hydrotherapy jets. Affordable option to turn a bathtub into a walk-in shower. An existing bathtub is modified to include an insert with or without a door. Allows the client to step into the tub over a lower threshold. A fiberglass shower that has a threshold between 3 to 5 inches. Available from Best Bath and other vendors in many sizes, with or without a shower door. Best Bath models can be custom colors and styles. Available with or without a built-in shower bench. Includes grab bars wherever needed Lever style controls with anti-scald feature. Hand-held shower on a grab bar with optional fixed shower-head. An independent support system that can be installed over the toilet to provide hand rails. An option is available that attaches directly to the toilet seat avoiding use of floor space. Moen grab bars with a peened surface recommended to avoid slipping when the bar is wet. Available in a number of different lengths and installed at appropriate places for the client. A Dependa Bar is a combination of grab bars and PT rails to make a pivoting support bar allowing for more mobility with the tasks in the client's bathroom. Mounted against the wall the Dependa Bar has multiple locking positions that help the client brace themselves while showering, or leaving the tub, sitting or getting up from the toilet and has an option to add a bath board as a removable bath tub seat. A Superpole is a support pole that can be installed anywhere in the home by expanding the pole between the floor and the ceiling, creating up to 450 lbs solid support. The Superpole has accessories such as the bar, safety island, tray, trapeze and a horizontal rail system. Stainless steel option is available for shower. Bio-Bidet products are offered in standard and bariatric models. Features include hybrid heating technology, touch screen wireless remote, manual flush, low profile design and a warm air drier and deodorizer. Extremely useful for hygiene for the mobility impaired. Aftermarket toilet seat attachment for the bariatric user, comes in an open or closed front style. Can be combined with a hand sprayer for hygiene. Custom built vanity in any size any combinations of drawers and cabinets that incorporates a 36" wide roll under space for wheelchair access. Includes a shallow sink with a goose-neck faucet for the wheelchair user and lever-style handles, plumbing is concealed. 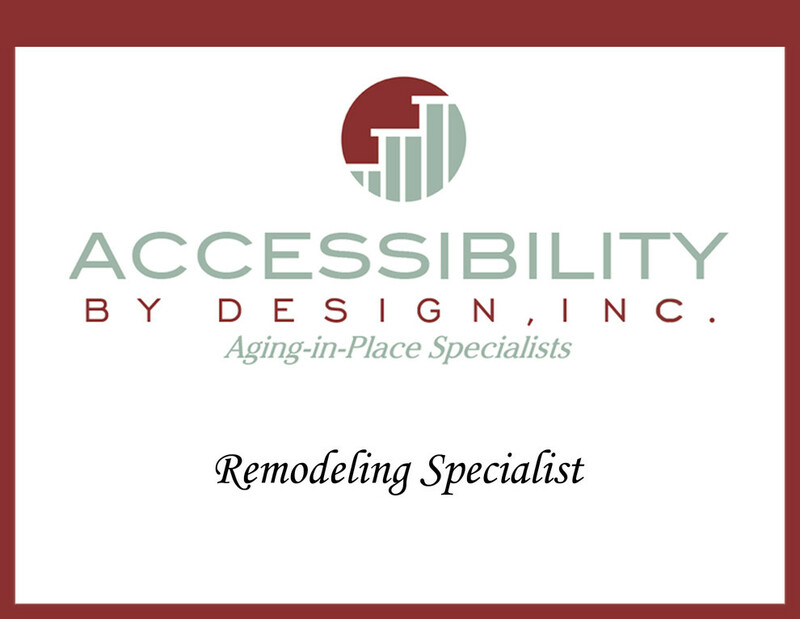 Cabinetry specifically designed for each client's accessibility needs and aesthetic desires. Custom carpentry where a wall is cut down and turned into wheelchair accessible roll under counter top room divider. Custom designed counter lowered for easy wheelchair access with shallow sink goose-neck faucet and concealed plumbing. Also known as point-of-use water heaters - gas options recommended to be installed where client has a need for large volumes of hot water, such as where a barrier-free shower and a walk-in bathtub may be used at the same time. A lift system that provides a seated ascension upstairs in a home. Ceiling track system to which a lift is attached that can be used with a sling to move a mobility impaired person from one place to another. We are a distributor for Barrier-Free Systems. A lift system anchored in concrete at the side of a swimming pool to allow hydrotherapy for the mobility impaired. For a rise under 4" a threshold ramp can be used. Aluminum, wood, rubber, and steel with rhino liner options are available. Custom carpentry. Doors widened for wheelchair access whenever needed. If widening is not possible due to the location of the door, expandable hinges sometimes can be installed. 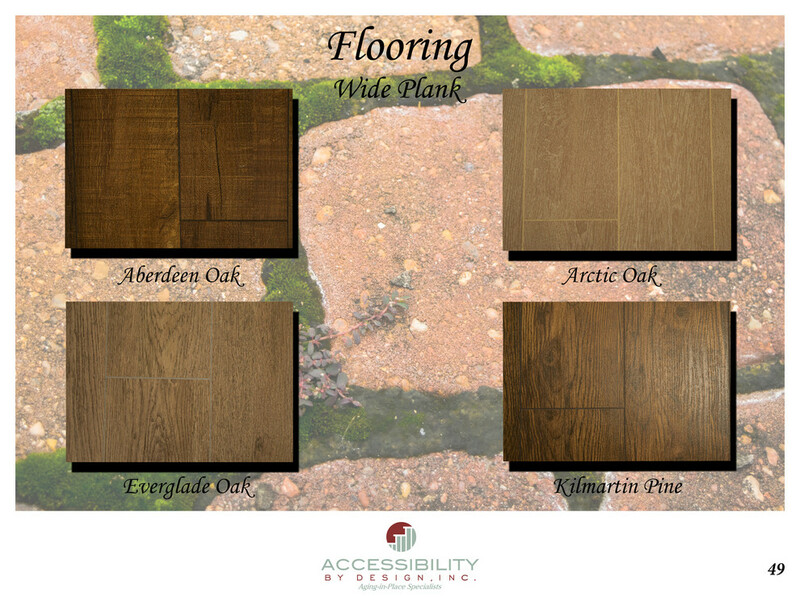 We are a distributor for US Floors and recommend cork flooring for the mobility impaired users due to its high coefficient of friction and resiliently soft surface that is durable for wheelchair use. Cork flooring is available in a wide variety of colors and patterns.